The Resistor Network: Hello World! Welcome to The Resistor Network! I have decided to create this blog as a place to share my technology-related projects. I have a deep interest in the field of embedded software design, electronics and, at a higher level, the development of dynamic web applications. My name is Andrew Rossignol, and I am passionate about electronics. I have been interested in electronics and technology since I was a child, when I would hook up simple series and parallel circuits. I started getting involved in embedded software development during my high school years. The ATmega Butterfly was my first demo board and I created simple PWM controllers and melody generators. I have been taking on personal and professional projects ever since! I like big cities and the constant energy that they have. I love every aspect of the 8-bit scene and own a Commodore 64 and a couple of accessories. The artistic and technical creations of members of the demoscene never cease to amaze me. 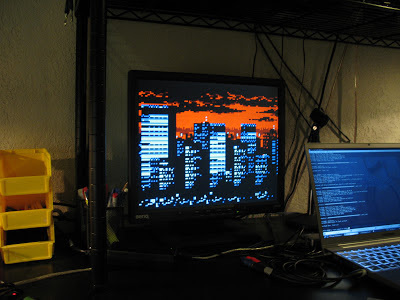 I have a nice collection of chiptunes that I listen to while coding. They keep me productive into the wee hours. I can be geeky when I enjoy technology of past years, but I also know the importance of modern computer architecture. Older equipment gives me a view of the foundations of many technologies that we know and use today. The resource constraints force me to be more efficient with the modern resource abundant technology that exists today.